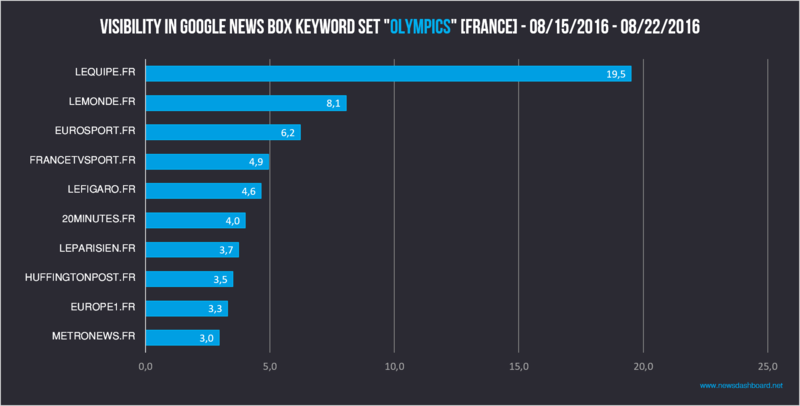 Rio 2016 analysis – which news publishers win the Google News Boxes in France? To read this article in French please scroll down. The Olympic Games in Rio are over – there have been some new world records and also surprises. A few “old hands” were successful again, like Usain Bolt or Michael Phelps. But which news publishers have been most successful in Google News in France? For the following analysis we created two sets of keywords around the first and the second half of the Olympic Games (you will find the lists of the keywords at the end of this text) and analysed the corresponding News Boxes. For our first set of keywords we chose 5th August – the day of the opening ceremony – until 15th August as our time frame. For the second one with a few additional keywords we chose 15th August until 22nd August, the day after the big final show. Before looking at the data created by the Trisolute Software News Dashboard, we cast a glance at Google itself. As the following screenshot shows, Google has developed a special information chart for the Olympic Games. It can be found at the top of the SERP (Search Engine Result Page) and contains information for the corresponding keyword (in this case: Usain Bolt). This leads to the assumption that Google News withholds some traffic from the news publishers, because the Google News Boxes with the latest articles for Olympic keywords are further down on the SERP, and the users can get their information straight from Google. Google has developed its own information graph for the Olympics. Nonetheless will those news publishers, which have been placed prominently in the Google News Boxes, have gotten more traffic than those that were rarely able to rank in the News Boxes. The following graph shows the top 10 concerning visibility in the Google News Boxes in the first half of the Olympic Games. It is little surprising that with lequipe.fr a sports page is leading by far on position 1. In the overall period of time (5th August until 15th August), 19.1 percent of all articles in the Google News Boxes for our set of keywords come from lequipe.fr. This makes the highest visibility in the Google News Boxes. On the other places follow news publishers that are all relatively close together. Metronews.fr, lemonde.fr, and europe1.fr on places 2 to 4 have a visibility of around 6 percent each. Other successful news publishers in the French Google News Boxes are, amongst others, 20minutes.fr, francetvsport.fr, and also eurosport.fr. Lequipe.fr has by far the highest visibility in the Google News Boxes. Who wins the Google News Boxes in the second half of the Olympic Games? In the second half of the Olympic Games, there are some differences in the Top 10. Lequipe.fr is still on first position with even a higher visibility (19.5 percent), but on the next positions there is a new order. On second position is lemonde.fr with a visibility of 8.1 percent. In the first half of the Olympic Games the site was on third position with a visibility of 6.2 percent. Metronews.fr which was on second position just can reach the 10th position in the second half of the Olympic Games. The site lost more than half of its visibility compared to the first days of the Olympic Games. There are also some other sites which changed positions, like europe1.fr and francetvsport.fr. In the second half of the Olympic Games there is also a new news publisher in the Top 10. Instead of linternaute.com, huffingtonpost.fr is in the Top 10 on position 8 with a visibility of 3.5 percent. Lequipe.fr still has by far the highest visibility in the Google News Boxes. In addition to the top 10 for the overall period of time, we also picked a keyword to look at the course of action in the Google News Box. We chose the exceptional sprinter Usain Bolt, who won the gold medal for the 100 meter race this year. 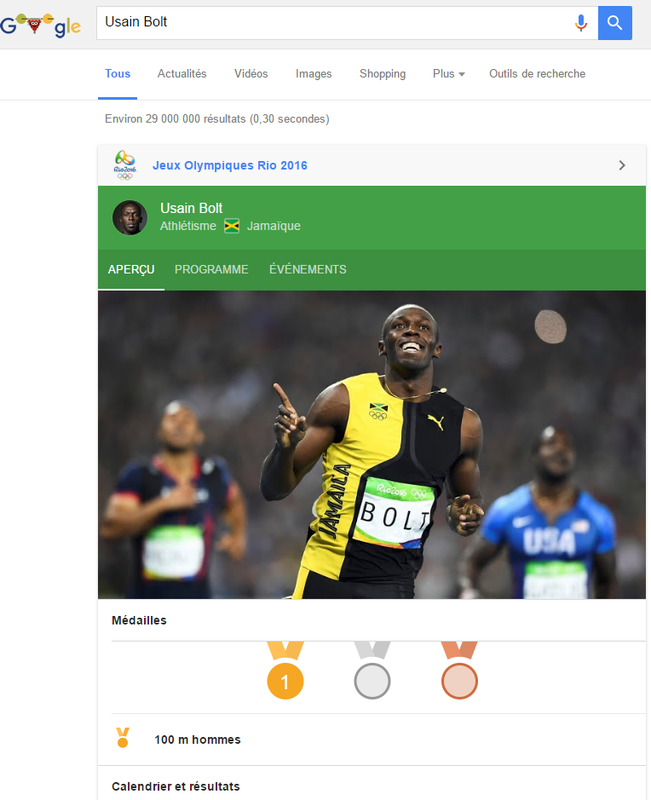 On 14th August, the day of his race, lequipe.fr was able to prevail in the Google News Box for the keyword Usain Bolt. Lequipe.fr held the first position almost all day. The sports page was only pushed off the first place between 9 a.m. and 9:30 a.m. by leparisien.fr, for the second time between 2:55 p.m. and 3:10 p.m. by 20minutes.fr, and at night from 9:30 p.m. on by lemonde.fr. 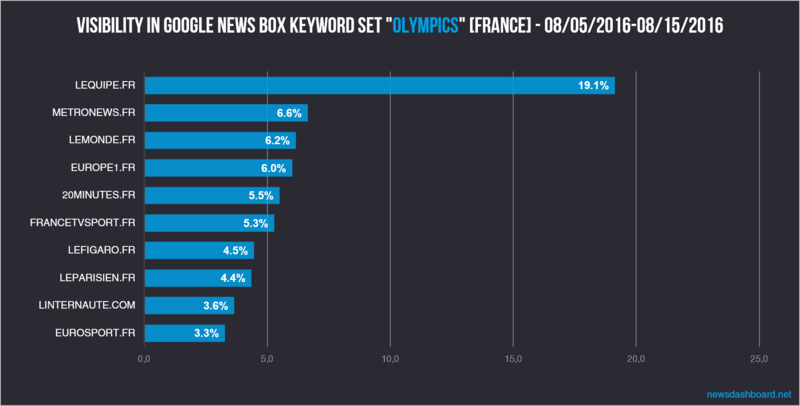 Other news publishers that were able to rank in the News Box are, amongst others, Olympic.org, rtbf.be, and eurosport.fr. 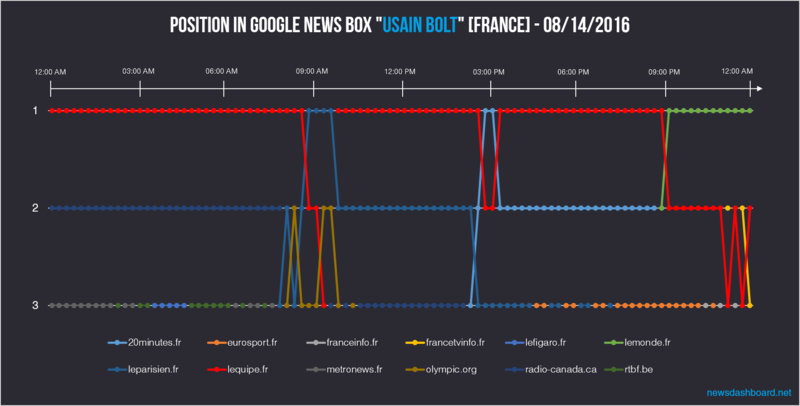 Lequipe.fr holds position 1 in the News Box for Usain Bolt most of the time. In summary, there is one big winner of the Olympics so far: lequipe.fr. This page has by far the highest visibility in the Google News Boxes. But other news publishers were also able to rank regularly in the News Boxes, like for example metronews.fr, lemonde.fr, and europe1.fr. athlétisme, aurélie muller, aviron, benoit paire, camille lacourt, clement mignon, cyclisme sur piste, escrime, fabien gilot, florent manaudou, floria guei, gymnastique artistique, gymnastique rythmique, haltérophilie, handball, hockey sur gazon, jeux olympiques favori, jeux olympiques rio 2016, jo 2016, jo 2016 live, justin rose, jérémy stravius, Lauren rembi, Mathieu bauderlique, mehdy metella, natation marathon, nikola karabatic, olympiades, olympiades 2016, olympiades news, renaud lavillenie, rio 2016, rio de janeiro, tableau des médailles, tableau des médailles rio, tableau des médailles rio 2016, team france jo, tennis, tennis de table, tony parker, triathlon, usain bolt, volley-ball, wayde van niekerk, william meynard, yannick agnel. Athlétisme, aurélie muller, aviron, basket-ball, benoit paire, Camille lacourt, clément mignon, cyclisme sur piste, décathlon, equitation, escrime, Fabien gilot, florent manaudou, floria guei, gymnastique artistique, gymnastique rythmique, haltérophilie, handball, hockey sur gazon, jeux olympiques favori, jeux olympiques rio 2016, jo 2016, jo 2016 live, justin rose, jérémy stravius, Lauren rembi, mahiedine mekkissi-benabbad, marie riou, Mathieu bauderlique, mehdy metella, natation marathon, Neymar, nikola karabatic, olympiades, olympiades 2016, olympiades news, renaud lavillenie, rio 2016, rio de janeiro, ryan lochte, steve gera, tableau des médailles, tableau des médailles rio, tableau des médailles rio 2016, team france jo, tennis, tennis de table, thoma simart, tony parker, tony yoka, triathlon, usain bolt, volley-ball.